In physics, displacement, which is a change in position, has a magnitude and a direction associated with it. When you have a change of position in a particular direction and of a particular distance, these are given by the magnitude and direction of the displacement vector. Instead of writing displacement as s, you should write it as s, a vector (if you’re writing on paper, you can put an arrow over the s to signify its vector status). When you’re talking about displacement in the real world, direction is as important as distance. For example, say your dreams have come true: You’re a big-time baseball or softball hero, slugging another line drive into the outfield. You take off for first base, which is 90 feet away. But 90 feet in which direction? Because you know how vital physics is, you happen to know that first base is 90 feet away at a 45-degree angle, as you can see in this figure. 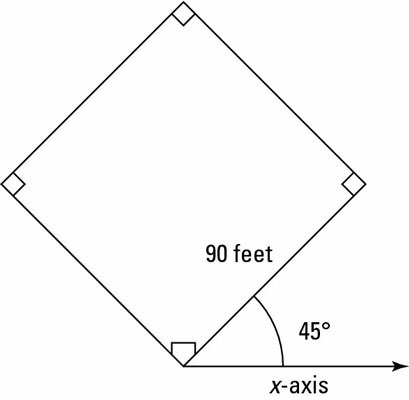 A baseball diamond is a series of vectors relative to the x-axis and y-axis. So the resulting vector is (80.0, 60.0). Hmm, that seems a lot easier than the directions you got. Now you know what to do: proceed 80.0 meters east and 60.0 meters north. See how easy adding vectors together is? You can, if you like, go even further. You have the displacement to the nearest bench in terms of x and y components. But it looks like you’ll have to walk 80.0 meters east and then 60.0 meters north to find the bench. Wouldn’t it be easier if you just knew the direction to the bench and the total distance? Then you could cut the corner and just walk in a straight line directly to the bench. This is an example where it’s good to know how to convert from the (x, y) coordinate form of a vector into the magnitude-angle form. And you can do it with all the physics knowledge you have. Converting (80.0, 60.0) to the magnitude-angle form allows you to cut the corner when you walk to the bench, saving a few steps. Voilà! The bench is only 100 meters away. So instead of walking 80.0 meters east and then 60.0 meters north, a total distance of 140 meters, you only need to walk 100 meters. Your superior knowledge of vectors has saved you 40 meters. And there you have it — the nearest bench is 100 meters away at 36.9 degrees from the x-axis. You start off confidently in a straight line at 36.9 degrees from the east, surprising the person who gave you directions, who was expecting you to take off in the goofy zigzag path she’d given you.